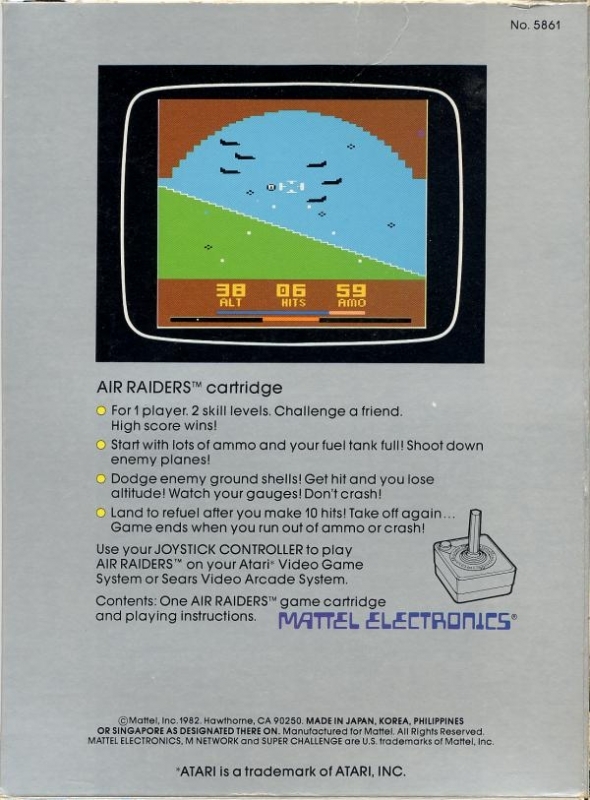 The object of the game is to blast enemy aircraft out of the sky... and dodge ground missiles!!! Zero in on enemy planes! Bank left, bank right, dive, climb out! Watch your elevation! Keep track of the fuel! Run out of ammo...land and refuel...take off again! It's a dogfight...you against the enemy! You're the pilot, gunner and navigator all in one!!! Enemy planes buzzing around you. Anti-aircraft ground forces are shelling you! Get an enemy plane in your sights and FIRE! Try to shoot down as many as you can! If ground fire (flak) explodes in your sight...you're hit...you quickly lose altitude. Climb back up! Stay clear of the flak! You must shoot down at least 10 planes before you can land and refuel then take off again! The game ends when you run out of ammo completely or when you crash! Press RESET and start again. Try to get a better score each time. Challenge a friend!